It's no secret that i'm a fan of teatoxes, regularly trying out what's new in the world of Instagram fitness inspo and wondering why I don't look like that really tanned girl doing yoga on the beach in that picture that I scrolled past on my feed - but mostly it's just the fact that i'm a raging tea fanatic. Since gaining weight during the Autumn, i'm now on a huge health kick and a mission to shed a few pounds, and getting back into the swing of things when you previously worked super hard (and are now about as fit as a 60 year old cigar smoker) is really difficult and sometimes discouraging. We all need a helping hand sometimes - be it a gym buddy, a new diet plan or a detox, and already being on a new diet plan and finding my time otherwise occupied I opted for the detox option. 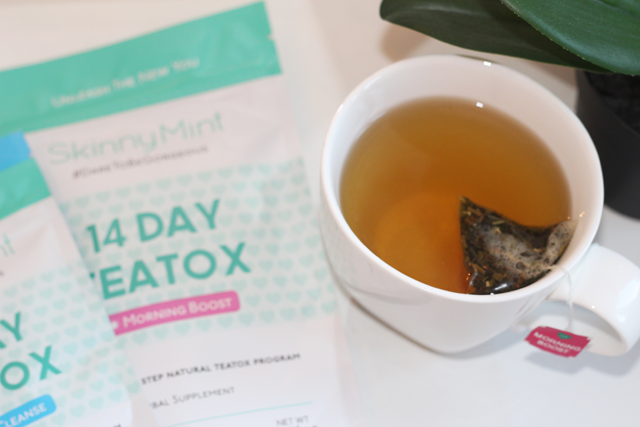 After trying a few of the popular teatoxes to no avail, I decided to go for Skinny Mint after a recommendation from a friend who told me how amazing she felt whilst doing their cleanse. The first thing I noticed on opening the Morning Boost packet was the strong, fruity scent and it smells delicious - and even better, it tastes delicious too. I'd describe it as a fruity green tea, and if i'm honest the taste makes a change from the other teatoxes that i've tried because of this (most have a strong, herbal/ginger taste). A lot of people have an issue with taste as they haven't acquired themselves to the herbal teas before, but I think this is definitely one that everyone can drink and enjoy without adding lemon and honey. I noticed immediate effects with this tea, feeling an increase in energy levels from day 2. Since I travel a lot every single day, i'm fairly lethargic on a regular basis and fall asleep during travelling, however I noticed that I was genuinely awake and in a non-false caffeine way. The Night Cleanse has a completely different taste, steering closer towards a peppermint tea taste. I'm completely used to herbal teas so I find this one fine to quickly swag down, although it gets a little harder to take the further down the cup you get (and the colder it gets). 28 days down and I didn't want it to be over. The 'slimming effect' slowed down after the first initial period, but I still really enjoyed the 'wellness' side of the detox and generally how it made me feel. 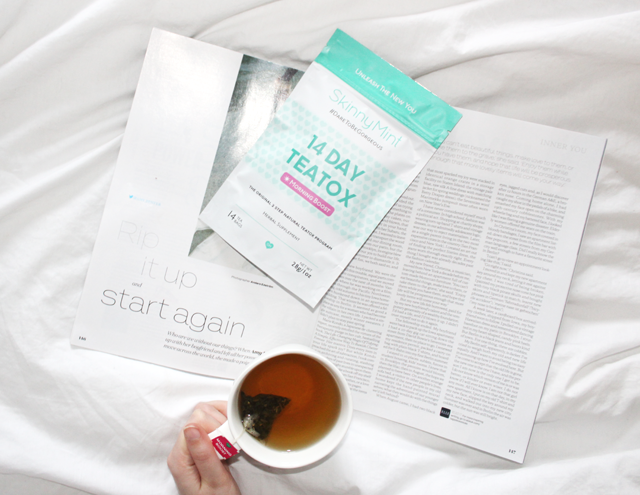 Out of the hundreds of teatoxes i've tried, this one was definitely my favourite and the only one so far that I hadn't had any issues with - so woohoo to SkinnyMint! The taste is amazing and I would even just drink this tea to enjoy it rather than the benefits I have had. One note that I would make is that if you are looking for results, this tea would be much more beneficial to someone who regularly exercises and has the discipline to eat well in the duration, as it would definitely be more of a helping hand that way. 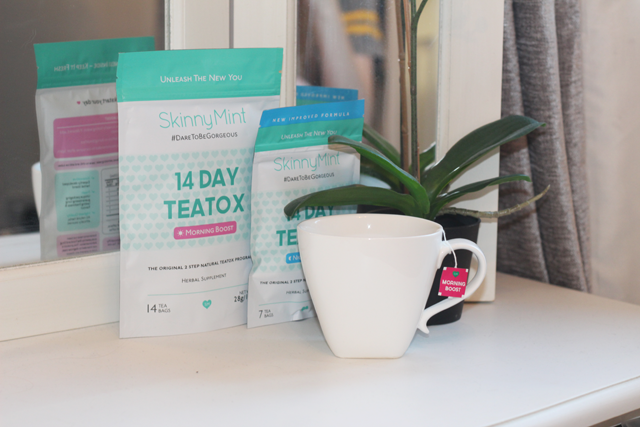 Big thank you to SkinnyMint for letting me try their amazing detox, I'll definitely be trying this again soon!